Unicorn Ambient Light: A mythical night light. 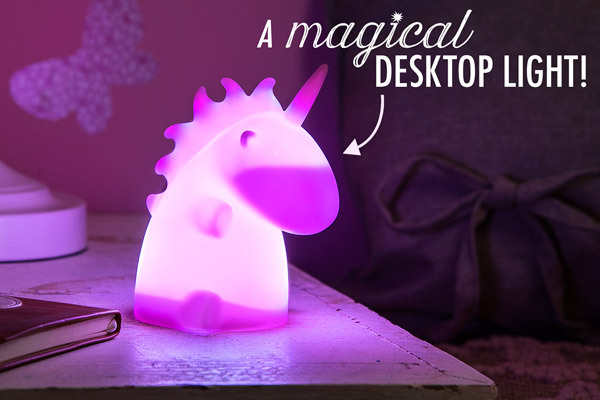 Perfect for late nights online, intense studying, or adding ambience to their room as young minds float off to dreamland, the Unicorn Ambient Light is a most magical desktop light. 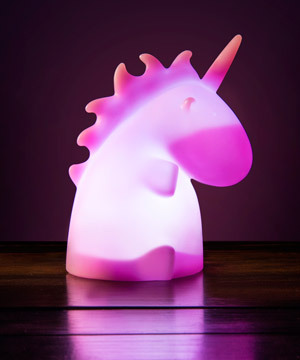 The mythical, adorable, and pink-horned stallion perches perfectly on a desk or nightstand, and emits a subdued pink glow when you flip its switch. Made from a durable PVC plastic, the Unicorn Ambient Light's long-lasting LED bulb provides low power consumption. Its small size (only five inches tall) and use of three AAA batteries means you can take its magic on the road. The unicorn is renowned for its elusive nature. That’s because their favorite spots are bedrooms where the occupants are sleeping. Unicorns are untamable, but they have formed a symbiotic relationship with children. The horned beast keeps the darkness away with an assuring glow in exchange for delicious, sweet dreams to eat. Legends of unicorns invariably mention their splendid appearance. This one-horned light is no exception. The lamp casts a gentle pink glow that’s not spoiled by any visible seams on its plastic body. The unicorn’s cute shape is enhanced with details like cupped ears and tiny little eyes. 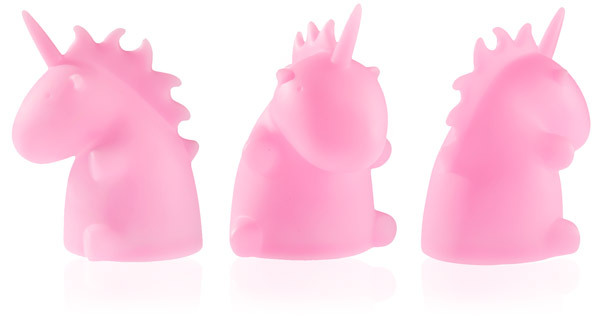 The Unicorn Ambient Light looks adorable from any angle. Question: Does the light get hot? Answer: Since the light source is an LED, it doesn’t give off any noticeable amount of heat. Question: Can I plug it in? Answer: No, the Unicorn Ambient Light runs solely on batteries. Question: How bright is it? Answer: The Unicorn Light is meant to give off ambient light (like a night light) rather than illuminate an entire room.